I received a copy of Cape Maybe through an offer by the author, with the expectation of a review. At the time of this writing, I finished reading Cape Maybe by Carol Fragale Brill about an hour ago. OH MY GOSH! Talk about getting into a story! This novel begins with the young main character, Katie, arriving home from school to find a not-so-good situation involving her alcoholic mother. Immediately, the reader is rooting for Katie, annoyed with but hoping for her mother, sympathizing with her grandfather. I have to tell you, there were parts of this story that were a little hard to read because of the honesty portrayed. The rawness of human emotion and reactions was so very well presented that I felt a range of my own emotions as I followed Katie through several years of her life. I should say, her difficult growing up years – the shame, the mistakes, the secrets, the lies, the promises, the denial, the anger, the tears, the discoveries, the regrets … but Cape Maybe is a story not only of the struggle but also one of love and hope. It is a story that won’t let you go, has to be heard, and doesn’t disappoint. Katie’s mother stubbornly clings to her addiction after many failed attempts at sobriety. Although hating what it did to her mother, Katie feels the pull toward alcohol, and at a young age begins the slow tumble down that dark tunnel. It is a story I’m sure many can relate to from one side of the experience or the other – meaning, as one caught or as someone loving the one caught. And it is a story that carries the reader on the bumpy ride of Katie’s struggle, not letting go until the very last page. Even then, the characters linger in one’s mind. When I reached that last page, I admit, tears welled up in my eyes. And I wanted more even though it was so fitting an ending. It was so well done I really felt that I didn’t want to go home from there! 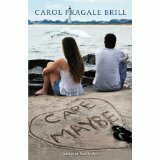 There are other things I would like to share about Cape Maybe by Carol Fragale Brill, but I don’t want to have to issue a spoiler alert. 😉 You are going to have to get your own copy to find out. I’m sure you won’t regret it. You can find Cape Maybe listed on my BUY THE BOOK! page. This entry was posted in Mostly About Reading, Reviews & Interviews and tagged AA, addiction, Al-Anon, alcoholism, Brilliant Beach Books, Cape Maybe, Carol Fragale Brill, family dysfunction, motherhood, women's fiction, young love. Bookmark the permalink. It was a wonderful read, Carol. Thanks for the privilege.